We know how important is “to be fit” in this life and we also know that It’s up to us where and how we choose to train! About two years ago we left Portugal (our home for 5 years) and went back to our birth country, Romania. In a couple of months we sold pretty much everything that we had, bought a car and a trailer and we began the craziest chapter of our life… so far! in one month we passed through Romania, Hungary, Slovenia, Italy, France, Spain, and Portugal; almost 4000 km of pure adventure: two adults, 3 kids, a Portuguese dog and a Romanian black cat! We have stories to tell and memories to share for a lifetime! I was so happy to recall our memories, review my photos and begin write this article! It was in the municipality of Cavallino-Treporti, after a long and exhausting drive searching for animal friendly camping(!) that we found a great campground in Scarpiland Village on the Cavallino coastline overlooking the splendid Adriatic Sea! We were lucky to find availability because it was the middle of July and all the campgrounds were fully booked!!!! So, here we were, in Italy , just 30 minutes by speedboat from Venice and her islands and just a stone’s throw from Jesolo! We had woken up early in the morning, leaving the car in the parking lot (remember: parking is pretty expensive) and taking a boat from Punta Sabbioni to Venice in aproxamately 40 minutes! Landing in Venice, the first thing we did was buy a map so we could begin to explore the narrow romantic streets, admiring the architecture of the buildings, the luxury gondolas, the ancient canals. We visited museums and churches and entered art shops, all the while taking time to rest in cafes and restaurants! We ran everywhere, developing our skills of slipping through the ocean of colourful people! We ate at Giorgio Restaurant, excited by their fresh food and friendly host! Then we continued our marathon until we reached a square with lots of cafes and Gellaterias! We had to stop and devour the best ice-cream in the world and bussolài (butter biscuits)! Finally, in the evening we took the last ferry and in 40 minutes we were back to our car! The kids were exhausted and so were we!!! 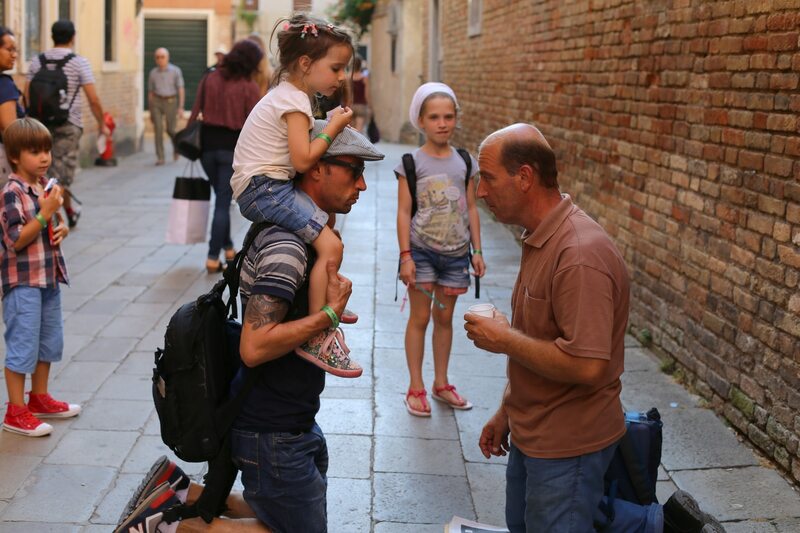 My dear friend, here is what you can do with the kids in Venice for a one day trip!!! Marathon! This keeps you and your family in the best shape! Tips: Take a small backpack with just the necessities ( water, sun cream, passports (or just the copies), and lip balm); keep it as simple as possible! Visit a museum or a church (you can plan and choose them before you go because time will be short and you want to be efficient). Go shopping – there are a lot of shops in Venice (beware of the the shinny object syndrome!!!). You don’t want to run the Marathon with a lot of heavy bags! We bought some Murano jewellery and a Bialletti caffe maker as we are Espresso fanatics! Don’t plan to visit too many places because you don’t want to feel the pressure in seeing too many places but rather enjoying what you do see. “Serenissima” at her best (we pinned Piazza San Marco, Piazzale Roma, Basilica Santa Maria Gloriosa dei Frari…St. Mark’s square Bell Tower and the Campanile). We kept it simple with this information about Venice! For us Venice is related with Roberta di Camerino, Antonio Vivaldi, Giacomo Casanova, Marco Polo, Murano Glass and Venetian Masks!!! Be ready to answer your kid’s questions and for this you have to keep calm; keep running and keep your mind in the present !!! Aris asked if we had landed in China because of the incredible number of Chinese people visiting Venice! Be flexible! Different families, different dynamics! Trust your intuition! Love you all, paint the best memories in Venice!